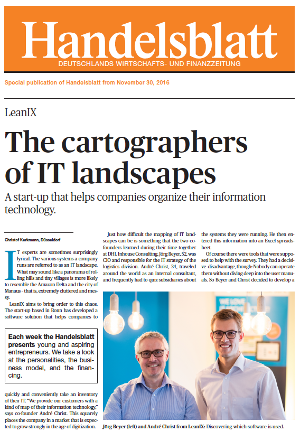 Each week the Handelsblatt presents young and aspiring entrepreneurs. It takes a look at the personalities, the business model, and the financing. Founders André Christ and Jörg Beyer came up with the idea for their business during their time together at the logistics specialist DHL. They work in Bonn with over 20 employees. For the first three years, the two founders of the start-up were self-funded. In 2015, Capnamic Ventures and Iris Capital invested €2.2 million in them. The market Enterprise Architecture Management is a niche discipline, but it is one that is growing. LeanIX estimates their market at up to two billion dollars. Read the full founder story by filling the form on the right!